The increasing digitization of the marketing communications industry has created a growing need for professionals who defy traditional roles. 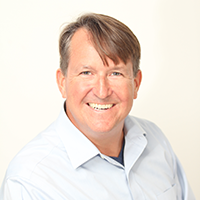 Today’s marketers must possess a blend of technical, creative, and business competencies. They must be nimble, strategic communicators who can seamlessly work across channels and disciplines. And they must know communications inside and out—this means not only understanding communications strategies, trends, and best practices, but also being able to apply them. According to a recent study by The Creative Group, 41 percent of advertising and marketing executives said it is difficult to find skilled creative professionals today. 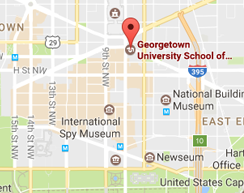 After graduating from Georgetown’s IMC program, you’ll have the well-rounded creative and analytical expertise that gives you a competitive edge and positions you to fill this skill gap. Our program’s multifaceted curriculum positions you for success in a variety of career paths and opens you up for opportunities spanning a breadth of industries, functions, and types of organizations. Graduates of our program have gone on to pursue roles within fields such as advertising, marketing, public relations, social impact and CSR, and digital media, among many others. You’ll leave the program with not only a strong foundation in both traditional and digital marketing strategies, but also a deeper understanding of brands, consumer insights, and the planning needed to bring the two closer together. 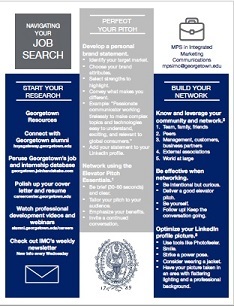 As a student, you’ll have the opportunity to work with Georgetown University’s Center for Social Impact Communication (CSIC), a research and action center dedicated to increasing social impact through the power of marketers, communicators, fundraisers, and journalists working together. CSIC provides industry and career resources such as applied research, graduate courses, community collaborations, and thought leadership. To learn more about CSIC and opportunities to get involved, visit csic.georgetown.edu.